In addition to documenting and preserving the rich and lasting contributions West Virginians have made to all genres of music, a primary mission of the Hall of Fame is to develop and implement educational programs that highlight those contributions for state residents both young and old. The Traveling Museum – This mobile exhibit space is operated in cooperation with the West Virginia Department of Education. Over the last few years, the Museum has visited scores of schools throughout the state, bringing its fun and challenging educational opportunities to thousands of students. The Museum has also appeared at numerous festivals, conferences and other events all over West Virginia. Music Career Counseling Program – The Music Career Counseling Program (MCCP) is an education outreach initiative that targets 10th graders who will be creating Personalized Education Plans and making choices about continuing their formal education or finding work – and whether to remain in West Virginia. 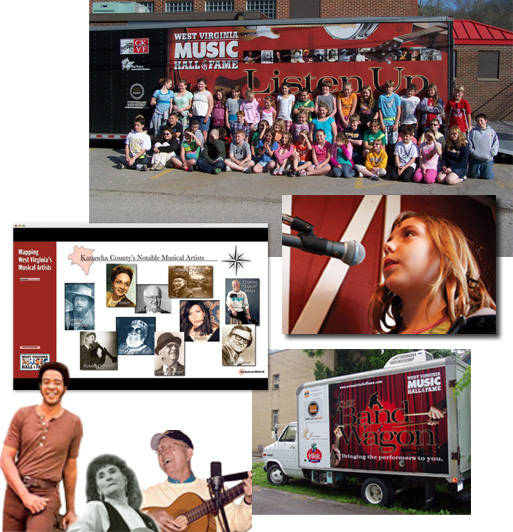 The Band Wagon – a mobile performance space that, like the Traveling Museum, brings Hall of Fame programs to communities throughout the state. Interactive Map – a touch screen virtual display of over 200 WV musical artists, also available on the web. The West Virginia Mambo – The Hall of Fame branched out into the world of dance with this instructional program that is offered to schools and other groups. Ideas for Teachers, Ideas for Students, and Ideas for the Classroom – offers biographical material and lesson plan suggestions on several of West Virginia’s best-known musicians and songwriters.